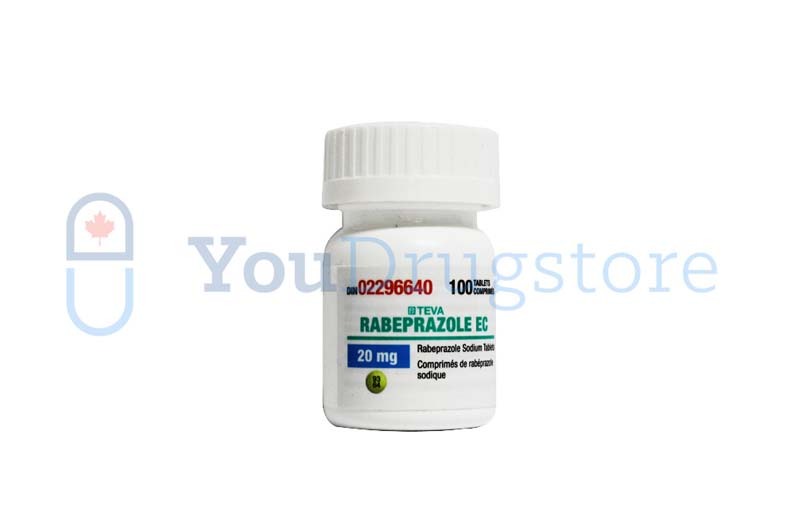 You can order Rabeprazole 20 mg from our Canadian online pharmacy, YouDrugstore. We are a licensed online pharmacy, where you can buy Rabeprazole 20 mg at the same price they pay in Canada. Just register on YouDrugstore.com and then send us your prescription. After we have received all of the required information from you, our staff of experienced pharmacy technicians and physicians will review your order. Ask your doctor to fax us your prescription directly at 1-877-448-5539 to speed up the process. 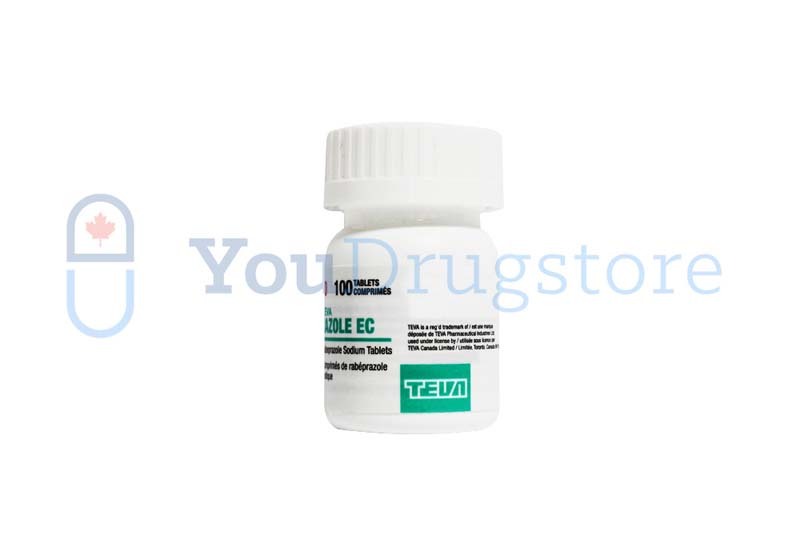 Purchase Rabeprazole 20 mg from YouDrugstore and we will ship your order right to you at an affordable shipping cost. Note that we also provide free shipping if your order is over $100. Rabeprazole is a generic drug that doctors prescribe to treat acid reflux disease. Order Rabeprazole 20 mg online from YouDrugstore today and start treating your acid reflux symptoms right away. Who might receive a prescription for Rabeprazole 20 mg from their doctor? Your doctor has prescribed Rabeprazole 20 mg to treat the symptoms you are experiencing due to acid reflux disease, or GERD. GERD stands for gastroesophageal reflux disease, which is a chronic state of damage to your esophagus. The damage is caused by stomach acid flowing up from your stomach. GERD can cause you significant discomfort in the form of heart burn, sore throat, and regurgitation. Before you take generic Rabeprazole to reduce these symptoms, tell your doctor if you are pregnant, if you are breastfeeding, if you are planning to become pregnant, or if you have any history of a major health problem, including any issues with your liver. Never take Rabeprazole 20 mg if you are allergic to it or any of its ingredients. Why is Rabeprazole 20 mg prescribed to treat acid reflux disease? Rabeprazole is prescribed to treat acid reflux disease, or GERD, because it is a generic drug that belongs to a family of medications known as proton-pump inhibitors (PPIs). PPIs work by reducing the amount of stomach acid your body produces, which helps prevent stomach acid from rising up into your esophagus. PPIs are one of the most widely prescribed drugs in the world, trusted to reduce symptoms such as heartburn and regurgitation safely. Rabeprazole not only treats the symptoms of GERD and acid reflux, but doctors will also prescribe it to aid in healing gastric, peptic, and duodenal ulcers. Order Rabeprazole 20 mg from YouDrugstore.com today and get a safe and trusted medication to reduce your heartburn and other acid reflux symptoms. What are the side effects of taking Rabeprazole 20 mg? Your doctor may have explained that when you take Rabeprazole 20 mg you could potentially experience dry mouth, nausea, headache, diarrhea or constipation, muscle pain, weakness, myalgia, anxiety, vomiting, insomnia, erythema, and vertigo. These are the most common side effects of taking Rabeprazole 20 mg. In rare cases, you may experience a change in heartbeat, muscle spasms, seizures, dizziness, and shakiness or trembling. Although these side effects are considered rare, they are also considered potentially harmful. Contact your doctor as soon as possible if you experience any of these side effects, or any other side effect that becomes severe or disruptive to your daily life while taking generic Rabeprazole. When should you take Rabeprazole 20 mg? Generic Rabeprazole 20 mg is almost always taken once a day by most patients. However, your doctor will determine the length of your treatment, depending on your condition. Never stop taking your medication sooner than your doctor has prescribed. If you do, your symptoms may return or become worse than they were before. Rabeprazole 20 mg tablets can be taken with or without food. Do not chew or break the tablets apart – swallow them whole. If you have any questions about how or when to take your Rabeprazole 20 mg speak to your doctor. Where can I learn more about Rabeprazole 20 mg?